Ever since I saw an episode of Alton Brown’s Good Eats, I’ve been dying to make English muffins. Yes, I know I can just run to the store and buy them, but where’s the fun in that? This weekend I decided to give it a go and looked over Alton’s recipe. There were all kinds of things involved like powdered milk, baking rings, electric griddles. Sorry, Alton, that’s not how the Quest Kitchen operates. Mix the yeast, sugar, and warm water in a small bowl and whisk to dissolve the yeast. You want the water to be warm but not too hot or you’ll kill the yeast. Set aside for about 5 – 10 minutes to allow the yeast time to activate. It will get foamy as it does its thing. Meanwhile measure the flour, salt and butter into a large bowl. Once the yeast is ready, pour the mixture into the dry ingredients and begin to mix with a spoon. If needed, add a little more water at a time until the dough begins to come together. You don’t want it to be too sticky but you don’t want it dry and crumbly either. Once the flour is mostly incorporated, use your hands to mix in the remaining flour. The dough will start to form a ball as you knead it. Knead the dough for about 5-10 minutes until it’s smooth and elastic. Place the dough ball in a greased bowl and cover it with plastic wrap or a damp towel. Place it in a warm area to rise for about an hour. Preheat your oven to 350 degrees and place a cookie sheet inside to preheat. Roll the dough ball out on a floured surface into a rectangle about 1/2 inch thick. I just pressed it out with my hands and it worked perfectly. Use a 3 inch round cutter or a floured drinking glass to cut out the muffins. I got 7 muffins total from my batch. Lightly dust them with cornmeal if desired for the full English muffin experience. Heat a skillet or frying pan over medium heat and spray with non-stick spray. Place a few of the muffins in the pan and cook them about 3-4 minutes per side until they begin to lightly brown. Flip them so that both sides get browned slightly. Remove them from the pan and place them on the preheated cookie sheet. 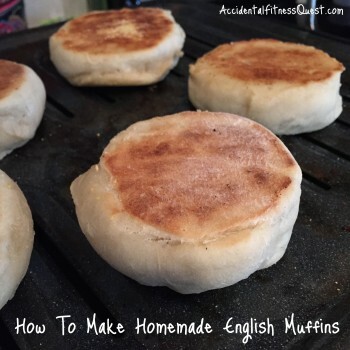 Bake at 350 degrees for 6 – 7 minutes until they look just like English muffins. Repeat with the remaining muffins. Cool them for about 30 minutes before slicing. Makes about 7 muffins at approximately 183 calories each – 4g protein, 35g carbs, and 3g fat. I think next time I might use almond or soy milk instead of water to see what that does to the flavor. They were fine made with just water, but most of the recipes I saw use some form of milk or powdered milk. It made me curious as to the taste difference almond milk would bring. I’m also dying to try a flavored muffin like pumpkin spice, apple, blueberry, or whole wheat.